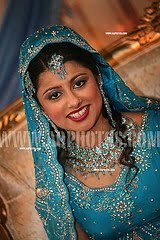 The article today focuses on Muslim bridal dress in the blue-green color. Blue-green is a great color option for bridal dresses. 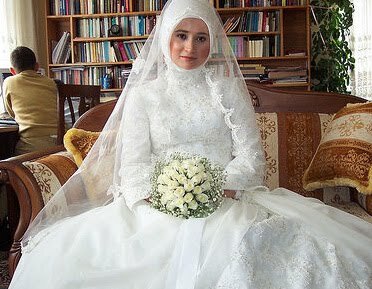 These days it is common to see Arab brides opting for all-white wedding dress ala Western style bridal dresses. I have posted Turkish style Western wedding dresses on this site before. They are obviously nice bridal dresses. But I hope Muslims understand that wearing white on their wedding day is not an Islamic tradition. White is a good color to wear, it does signify cleanliness and purity. But at the same time, it is not Islamic. Why do Western brides wear white on their wedding day? Did you know that the tradition of wearing a white wedding gown only began in the Victorian era? Dr Leigh Summers is an expert on the history of clothes and recently told nights presenter Annie Warburton the white wedding dress was initially a status symbol and not an indictor of a woman's virtue. Queen Victoria is generally credited with having started the white wedding dress craze. In Victorian times, a woman who could afford an expensive white dress for a one-off occasion was thought to be at the top of her social tree. Because delicate garments were near impossible to keep clean, a wedding dress could be worn just the once and only people with a lot of money could afford to purchase one. "It was a clear indication you were a wealthy women and that you were marrying into wealth," Dr Summers told Annie. Prior to Queen Victoria women used to wear every day clothes for the wedding ceremony with a white veil and Orange Blossom to indicate the significance of the event. It was after World War II the white wedding dress became an indication of a woman's virtue. Dr Summers said she believes the reason the tradition of the white wedding dress has survived, is due to the lack of romance and excitement in a woman's life. It is always a nice idea that we experiment for more! Because the traditional white dress gets boring already! This is such a great idea! Thanks and good luck!